libvirt-qemu: a small set of QEMU specific APIs, such as the ability to talk to the QEMU monitor, or attach to externally launched QEMU guests. This library builds on top libvirt. libguestfs: the library for manipulating and accessing the contents of guest filesystem images. This uses libvirt for some actions internally. libguestfs has its own huge set of language bindings which are not shown in the diagram, for the sake of clarity. It will also soon be gaining a mapping into the GObject type system, which will help it play nicely with other GObject based APIs here. The language bindings for libvirt aim to be a 1-for-1 export of the libvirt C API into the corresponding language. They generally don’t attempt to change the way the libvirt API looks or is structured. There is generally completely interoperability between all language bindings, so you can trivially have part of your application written in Perl and another part written in Java and play nicely together. The object mappings are distinct from language bindings, because they will often significantly change the structure of the libvirt API to fit in the requirement of the object system being targeted. Depending on the object systems involved, this translation might be lossless, thus an application generally has to pick one object system & stick with it. It is not a good idea to do a mixture of SNMP and QMF calls from the same application. libvirt-snmp: an agent for SNMP that translates from an SNMP MIB to libvirt API calls. The development of a set of GObject based libraries came about after noticing that many users of the basic libvirt API were having to solve similar problems over & over. For example, every application wanted some programmatic way to extract info from XML documents. Many applications wanted libvirt translated into GObjects. Many applications needed a way to determine optimal hardware configuration for operating systems. The primary reasons for choosing to use GObject as the basis for these APIs was first to facilitate development of graphical desktop applications. With the advent of GObject Introspection, the even more compelling reason is that you get language bindings to all GObject libraries for free. Contrary to popular understanding, GObject is not solely for GTK based desktop applications. It is entirely independent of GTK and can be easily used from any conceivable application. If libvirt were to be started from scratch again today, it would probably go straight for GObject as the basis for the primary C library. It is that compelling. libosinfo: an API for managing metadata related to operating systems. It includes a database of operating systems with details such as common download URLs, magic byte sequences to identify ISO images, lists of supported hardware. In addition there is a database of hypervisors and their supported hardware. The API allows applications to determine the optimal virtual hardware configuration for deployment of an operating system on a particular hypervisor. gvnc: an API providing a client for the RFB protocol, used for VNC servers. The API facilitates the creation of new VNC client applications. spice–glib: an API providing a client for the SPICE protocol, used for SPICE servers. The API facilitates the creation of new SPICE client applications. libvirt-glib: an API binding the libvirt event loop into the GLib main loop, and translating libvirt errors into GLib errors. libvirt-gconfig: an API for generating and manipulating libvirt XML documents. It removes the need for application programmers to directly deal with raw XML themselves. 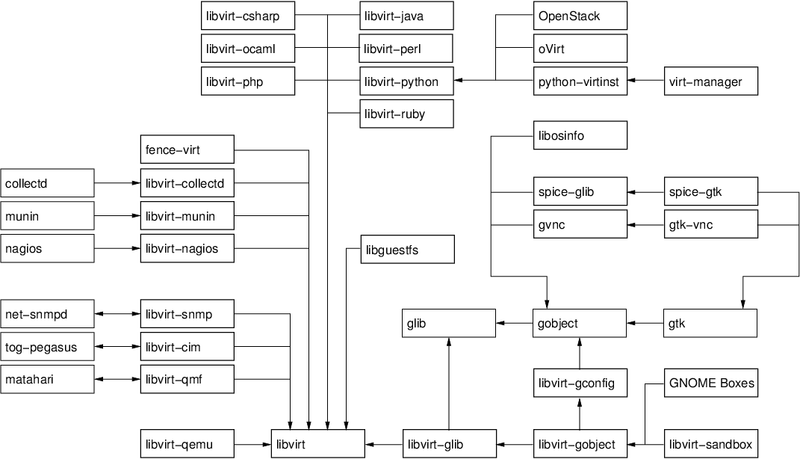 libvirt-gobject: an API which translates the libvirt object model, also integrating them with the lbivirt-gconfig APIs. libvirt-sandbox: an API for building application sandboxes using virtualization technology. OpenStack: the umbrella project for building an open source cloud management application. Its Nova component uses the libvirt python language bindings for managing KVM, Xen and LXC hosts. GNOME Boxes: the new GNOME desktop application for running virtual machines and accessing remote desktops. It uses libirt-gobject, libosinfo, gtk-vnc & spice-gtk via automatically generated vala bindings. Create a remote-viewer library which pulls in both gtk-vnc and spice-gtk in a higher level framework. This is essentially pulling the commonality out of virt-viewer, virt-manager and GNOME boxes use of gtk-vnc and spice-gtk. There is undoubtably plenty of stuff I left out of this diagram & description. For example there are many other data center & cloud management projects that are based on libvirt, which I left out for clarity. There are plenty more libvirt plugins for other applications too, many I will never have heard about. No doubt our future plans will change too, as we adapt to new information. This should have given a good overview of how broad the open source virtualization tools software development ecosystem has become.